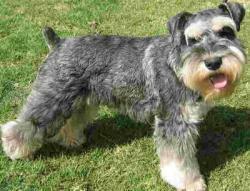 The Miniature Schnauzer is a small, sturdily built dog. The body is square and proportionate. The strong head is rectangular in shape. The width of the head grows slightly smaller from the ears to the eyes. The muzzle is strong and ends rather bluntly. The nose is black. The bite is scissor. The deep-set, small eyes are dark brown in color. Ears set high on the head are often cropped to a point. When the ears are left natural they are small and V-shaped, folding close to the head. The front legs are straight. The docked tail is set high and carried erect. The tail is cropped just long enough so that it can be seen over the backline of the dog. Note: It is illegal to crop or dock a dog’s ears or tail in most parts of Europe. The Mini Schnauzer has a double coat. The outer coat is wiry and the undercoat is soft. The coat is clipped so it has a bushy beard, mustache and eyebrows. Coat colors include black, white, salt and pepper, and black and silver.